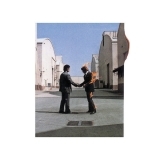 Wish You Were Here is ranked 2nd best out of 31 albums by Pink Floyd on BestEverAlbums.com. The best album by Pink Floyd is The Dark Side Of The Moon which is ranked number 2 in the list of all-time albums with a total rank score of 176,091. Members who like this album also like: The Dark Side Of The Moon by Pink Floyd, Led Zeppelin IV by Led Zeppelin and The Wall by Pink Floyd. Saint Rocke, Hermosa Beach, United States. The tracks on this album have an average rating of 91 out of 100 (all tracks have been rated). Related links: top tracks by Pink Floydtop tracks of the 1970s, top tracks of 1975. Showing latest 5 ratings for this album. | Show all 3,174 ratings for this album. The Wall and Wish You Were Here often compete for me for Pink Floyd's best album. Shine on You Crazy Diamond alone warrants this as a top 100 album. It just so happens that there are three other great songs on it as well. Best track: "Shine On You Crazy Dimaond"
Weakest track: "Have A Cigar"
We all know that Dark Side of the Moon is Floyd's magnum opus, the iconic album of the 70s, and one of the great pieces of musical art ever created. But for it's ability to truly transport you to another, mystical place, Wish You Were Here strikes me as the more consistently transcendent work. I especially like the unpretentious tribute to Barrett and unabashed critique of the music industry with both themes being melded into a seamless whole. The album magnificently explores the theme of absence, with the ghost of Syd Barrett in the background. He is also an angry critic of the music industry, devoid of humanity. This is for me the most successful album of pink floyd and the 70s. A masterpiece. Anyone thinking Pink Floyd couldn't follow up their 1973 masterpiece, The Dark Side Of The Moon, would be proved very wrong upon the release of this album. Cut from a completely different cloth - lots of hard edges, where Dark Side was softer in its compositions - and with a new story, Wish You Were Here is pretty close to perfection. It is bookended by two glorious halves of the same piece, each telling the tale of former member Syd Barrett and his fall from grace. These pieces are delicate and beautiful, and the words speak of sensitivity towards their subject matter. The title track is the centrepiece, though. Its gossamer guitar line and wrought lyrics are enough to move one to tears. As is often said in relation to this album, David Gilmour really showed the other side of his guitar work. If you are into prog rock, and even if you aren't, this is an album you should seek out. Pink Floyd is one of the bands that has brought the most to music ... They are pillars of Progressive Rock, space rock and blues rock. This inescapable group is the author of many musical masterpieces such as "Animal", "Wish You Were Here" or "The Dark Side Of The Moon" (For me, "The Wall" is not an excellent album). But the best of all these albums is "Wish You Were Here". This album is much more ambitious and successful than "The Dark Side Of The Moon", which is a bit overrated. The album is amazing, although it was recorded in difficult conditions for the band, Pink Floyd has managed to do even better than on the previous album, "The Dark Side Of The Moon". The melodies are perfect, the solos of Gilmour are magical and the experimental sounds are really revolutionary for the time. I love this album !!! All the songs are beautiful, this album is one of the greatest classics of all time. Very good job of Pink Floyd ! Best track: "Shine On You Crazy Diamonds, Pts. 1-5"
Whish You Were Here est le meilleur album des Pink Floyd. Oui, je préfère Wish You Were Here à The Dark Side Of The Moon, il est clairement meilleur. Composé de seulement 5 titres, cet album vous fait voyagé dans un monde psychédélique où le blues règne. Je considère cet album comme l'un des meilleurs de tout les temps. 10/10 sans hésiter. Mention spéciale pour tout les titres, il n'y a pas de déchet.